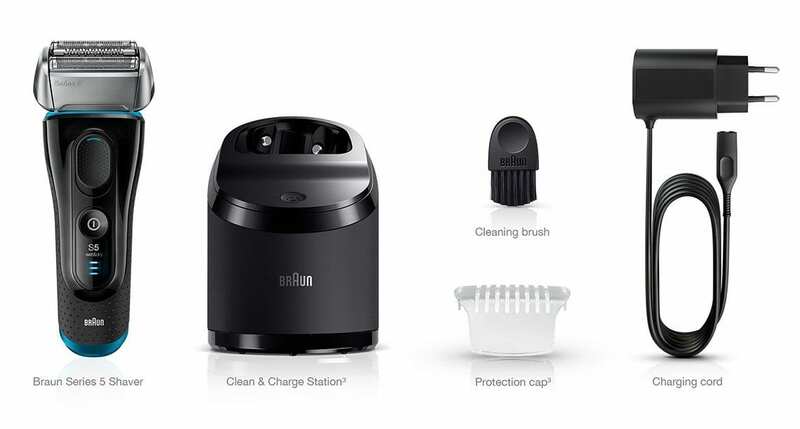 with Clean & Charge station and protection cap, black / blue. with protection cap and soft travel bag, black. The new Series 5 with it’s innovative AutoSense Technology and 8 direction flex head gives you the most comfortable shave on every part of your face. Braun’s new Series 5 with AutoSense Technology reads your beard and adjusts its power to its thickness, 13 times a second. Providing extra power exactly where it’s needed, the Series 5 delivers unprecedented one stroke performance. Fewer strokes are needed meaning it’s less harmful to skin, protecting its condition. Discover the power of sonic vibrations. Maximum performance & excellent skin comfort. With innovative Skin-Sensitive Technology.